In learning, the choice to express a personally creative interpretation or idea may depend on balancing risk of potential costs with hope for potential benefits—social ridicule versus recognition, for example (Beghetto, 2009). During early adolescence, the support provided in the environment, along with an individual’s established intellectual capital, may dictate these expectations and choices (Eccles & Roeser, 2011). As research has found that perceived curricular meaningfulness predicts valuing of school (Roeser, Eccles, & Sameroff, 2000), relevance of content may influence the investment in creative ideational activity of students. In highly structured environments, such as classrooms, creative ideational behaviors and the social mechanisms influencing them set up cognitive and motivational patterns that may play a role in the development of creative potential (Eccles & Roeser, 2011). 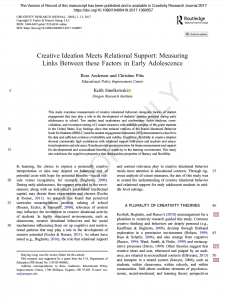 As others have noted (e.g., Beghetto, 2016), the role that relational support and content relevance play in creative ideational behavior needs more attention in educational contexts. Through rigorous analysis of extant measures, the aim of this study was to extend the understanding of creative ideational behavior and relational support for early adolescent students in middle level settings.